Earlier this week, gesture recognition technology company eyeSight introduced ControlAir, an app that uses a Mac's camera to read finger-based movements, allowing users to control various media applications without needing to physically interact with their computers. The app, which is free to download, works with many popular Mac-based entertainment apps like iTunes, Spotify, Rdio, Netflix, QuickTime, VLC and Vox. The main control scheme is a user's index finger, which, when raised, calls up ControlAir's user interface banner. 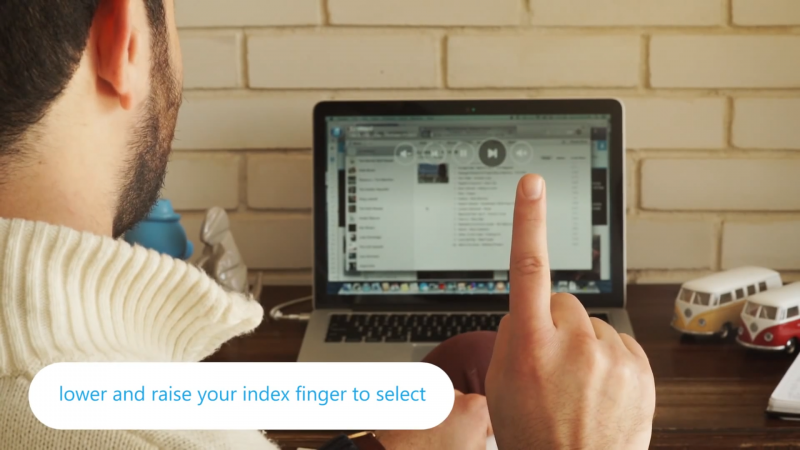 Users drag their fingers left and right to highlight the volume rockers, previous/next and play/pause buttons, lowering their index fingers in an "air-click" motion to select and raising their fingers to their lips to mute. Once the designated app is open, ControlAir's touch-free functions will still be able to be called up even if the ControlAir app sits in the background of another. ControlAir's responsiveness is impressive, and the app is compatible with any iMac, MacBook Pro, and MacBook Air with OS X 10.9 or later, but its constant requirement of access to a computer's camera functionality may hinder its usability for some. As long as a compatible app is open, the green camera-indicating light will remain on until the app is closed. ControlAir can recognize gestures up to five feet away, according to eyeSight, but still picked up and smoothly recognized inputs from up to seven feet in MacRumors' testing. The limits to the app's current functionality are hoped to be addressed incrementally in the future, with eyeSight specifically promising more entertainment app support will be "coming soon." Flipping the bird should cause a Force Quit. Not to mention, I find the keyboard controls work really efficiently without looking at they keyboard...even while reading a book or making my cats dance. Is that what kids nowadays are calling it? Making your cats dance. It's kind of a bummer that once upon a time, we used to feel pretty good about pointing and laughing at people like you. ...before the spooky bastards had to go and admit to congress that accessing anyone and everyones built-in cams without their knowledge was not only something they could do but do actively do at will. Do you wear a tinfoil hat as well? Who cares about being able to pause and play music with your hands? Give me Safari support! "It appears that FrizzleFryBen tried out the new ControlAir app and he forgot to turn it off yesterday afternoon. Now we have finally documented his 'O-face' and can add it to our database. Thank to all the folks at eyeSight. You're all true patriots in the eyes of the government." this feels like something that would've come out in 2007.